The entrance to the chapter meeting is important. It's a display saying "What you see is what you get (WYSIWYG)" when looking in from the entrance. From a boy's point of view coming in for the first time should give him the impression this room has its possibilities for him to "Hang" . From the parent(s) point of view, they are looking to see if there are possibbilities, opportunities, safety, and if there is a freedom for their son to come and go as he chooses. Having fun is a part of teaching any person at any age. Boys at this age thrive on fun and play as they learn. In order to show there is fun and recreation used during their chapter meeting time, the room where the chapter meeting has got show there is fun and recration. If you look carefully, there is a combination soccer/billards/hockey table in the center of the photo along with a computer monitor that happens to have some computer games installed in it. Posters and visual aids such as globes, maps, posters, chalk boards, dry ink boards on ezels, and computers are excellent tools to use in the chapter meetings to teach boys about missions and a world around them. If you look in the photo there is a big map on the wall that is a 8 pain murrell (12 x 20) that was purchased at a popular building supply store that has a department that offers wall paper and wall paper supplies. Any wall paper stores carries maps of the world and scenes of countries that can be installed in the chapter meeting room to help aid the learning experience. 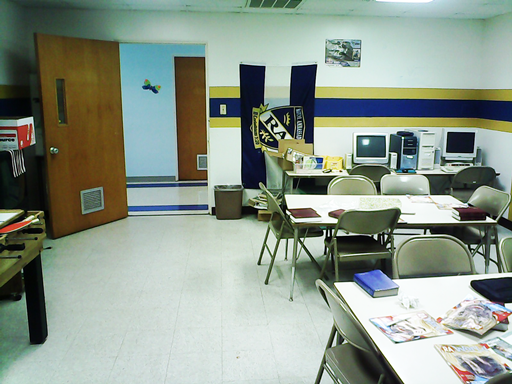 This map is the central focus of the chapter room. Immediately, that says missions around the world is the most important thing that is taught. Notice the strips are the colors of the Royal Ambassador program. 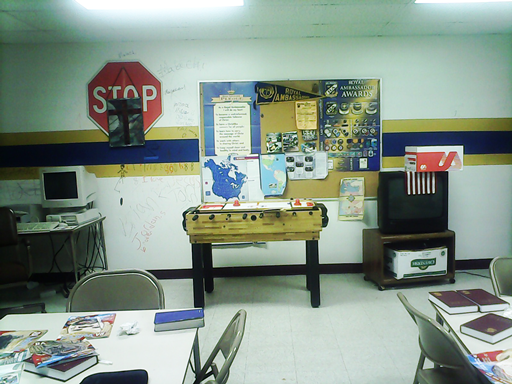 Colors that are displayed in the room helps the learning atmosphere. Also, ask your boys to bring extra posters that they may have that are not being used. The posters may have their favorite sports figure, motorcycles, skateboard competition posters, sports cars, etc. Make sure the boys understand these posters are decent, of good taste, and are God honoring. You will be be surprised how valuable that makes the boys feel to do something like this. Making the room special where you have the chapter meetings is very important. This special place in the room will have the boys want to come. It could be a bay window fixed up by the creativity of all of boys to make it better. Turning it into a place of their own, they have all of the reason in the world to call it their "Cave". If you look at the photo, you will see a marked up wall. Those marks are signatures of boys and their "Art Work" they did. The collection of what is found on this "Signature Wall" spans an 8 year period of time of all of the boys that have been coming to R.A.'s at this church and it is not coming off nor masked with "Kills"(a paint sealer). Any boy that comes back to this room and finds their signature will remember what happened in this room while they were there.